This is a really cool 1938 Ford truck. A few people will not like that I am in the image as a reflection, but, in this image, I did that on purpose. It was a way of taking credit for my work. … Next time, I will take two versions of the image, one with me, and one without me. Options are always good. That is the way I shoot images. I do the homework first, planing all the shots I intend shooting, and then I shoot those shots, and I am open for unexpected shots that are sometimes very interesting. … After the shoot, and after the editing, I reconstruct what the shoot became, and adjust for the next shoot. 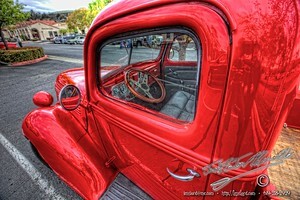 This entry was posted in Performers, Purchasable - Cars As Art, Transportation. Bookmark the permalink. ← Jewel – Crystalline Ice Plant.